The ways in which companies communicate with their customers is vital if they are to harness relationships and there are more ways to do this than ever. Social media has a large part to play in these communication strategies but a channel that is becoming more frequent is the implementation of ‘chatbots’. A chatbot (chat-bot) is a computer program with which businesses communicate with their audience in either an auditory or text-based manner. The programs are designed to offer automated responses to questions in a manner that simulates actual human conversation. Typically they are used to generate the dialogue that would surround customer service based questions or in an instance where customers are looking at acquiring information. 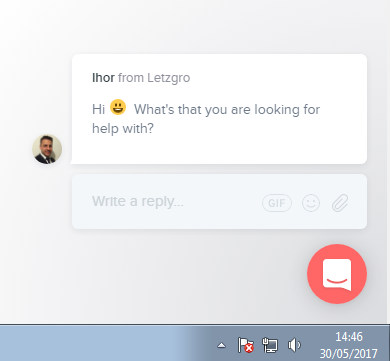 The chatbots are put in place by businesses, usually on the homepage of their main website in the form of a pop-up. The introductory message will usually be friendly and ask the user if they want to talk to someone, ask a question or if there is anything they need help with. The user can then type in the question as if they were using a messaging app and a response will be generated. In the back-end of the system there will be a list of stock answers to the questions asked and whilst human input is needed in the build phase, much of the development is through machine learning. The majority of answers are generated by systems that scan for keywords within the input, and then pull out the reply with the most matching keywords, or the most similar wording pattern, from a database. Increasingly sophisticated responses are largely down the natural language processing systems that businesses put in place. This versatility and the improved functionality of the platforms that have been created represent huge opportunities to connect businesses and users; means the future looks increasingly bright. As we have previously mentioned there are two main types of chatbots. The first are those whose functions are based on a set of rules which are very basic and then there are the more advanced chatbots that use machine learning. This type of chatbot uses artificial intelligence (AI) and offers the user, who is presumably looking for something they themselves do not know, the chance to be less specific in their questioning. Those that rely on AI allow consumers to be non-specific in their query and as such use language as well as commands. The bot also gets smarter as it learns from the conversations that it has previously had and therefore expands the responses that it can generate. With consumers looking at interacting with businesses more often there has been a rise in the way businesses operate online. Users globally are logging in to messaging apps to not only chat with friends but also to connect with brands, browse/purchase merchandise, and view content. 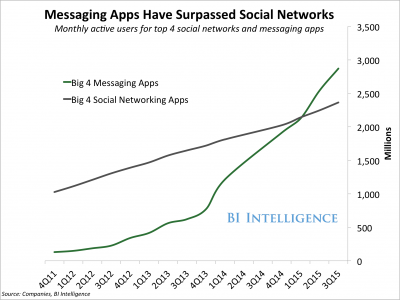 Interestingly the latest findings by Business Insider, suggest that bots and messaging apps are on the rise with more users than ever. Facebook Messenger is currently used by over one billion users per month as is their other messaging app, WhatsApp. Both of these platforms are picking up and retaining users far faster that the parent platform, Facebook. The acceleration that the industry has seen is frightening with the big four messaging apps (WhatsApp, Facebook Messenger, QQ Mobile and WeChat) garner more users than the big four social media sites, Facebook, YouTube, Instagram, Tumblr). As of January 2017 there were 3,723,000,000 active monthly users of the top four messaging apps as seen below. So why has the rise been so dramatic? Well, it’s simple. As we move to a more mobile first society and with mobile devices and data falling in price, growth is inevitable. Chatbots speak real language – The language of apps is based on technological single-word commands like signup, login, download, click, and it lacks such social language as please and hello. Whilst this gives direct answers to the user and finds solutions based on keywords it is not very personal. Chatbots offer better user experience and are more likely to build relationships and trust. Better interaction – Chatbots are the best tools for keeping users on a certain platform longer and keep the content flowing by starting and maintaining the conversation. By giving small amounts of information and learning from every question the results appear more conversational. Chatbots are cheap to build – Building a basic chatbot is fast and, as a result, inexpensive. Maintaining one is not an issue either and if you go for the more advanced, AI friendly version the platform grows with your customers. Businesses can use simple code and pre-load the chatbot with keywords and answers to FAQs and update them as and when they change or expand their offering. Chatbots are quick to build – As you may expect with the rise of mobile, many of the major websites and social media sites now offer integration with their platforms. There are variety of bot templates and ready-made software developed by Facebook, Microsoft and others that you can use for free, and they will only need small tweaks to be ready for your customers. The future for these sorts of apps and services appear to see no sign of slowing. As businesses grow their audience the ability to offer personal contact or a ‘human helpdesk’ are virtually impossible. This means that investment is inevitable and the technology and reach will continue to increase. When Business Insider conducted their study they key points were that the advancements in artificial intelligence, coupled with the proliferation of messaging apps, are fueling the development of chatbots. This means that software programs that use messaging as the interface through which to carry out any number of tasks, from scheduling a meeting, to reporting weather, to helping users buy a pair of shoes has huge potential. Foreseeing immense potential, businesses are starting to invest heavily in the burgeoning bot economy and a ‘number of brands and publishers have already deployed bots on messaging and collaboration channels’. To find out how we can help improve your website’s visibility and performance get in touch with us today.